A “dual boot” system disk allows you to run two different operating systems on the same computer. We do this by “partitioning,” or dividing, the internal boot disk into two or more sections, each with its own version of the macOS. You want to retain an older version of the macOS to support older programs, while still upgrading to newer versions to run current and future programs. I wrote about this process a few years ago – read it here – when many editors wanted to retain access to OX X 10.6.x to run Final Cut Pro 7 and DVD Studio Pro. I don’t know what applications we have today that we will want to run in the future, but, just in case, here’s how to create a dual boot disk using macOS 10.13.5 (High Sierra). While the concept of creating a partition is the same, the process is different. NOTE: If you are working this tutorial along with me, please read the entire article first. My initial settings caused an error, which you can avoid by reading this through first, then create a new partition second. 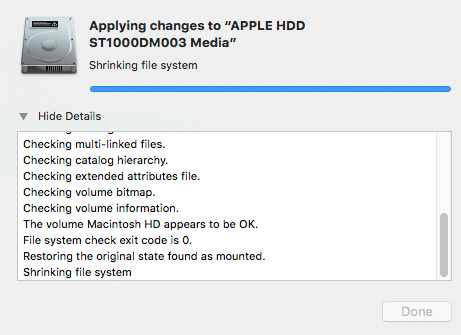 Dividing the boot drive is perfectly safe – Apple supports doing so in Disk Utility – provided you have enough free space on your internal storage to support creating both partitions. However, it is time-consuming. 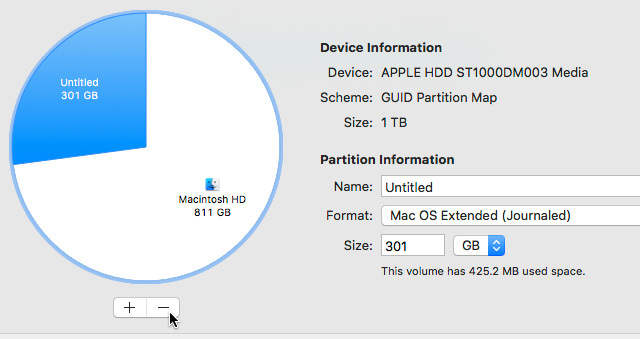 By default, your boot disk (that’s the internal storage used by your Mac) is set to a single partition. What we are doing is changing the partition map to divide your hard disk into as many sections as you want. IMPORTANT NOTE: Adding additional partitions doesn’t increase the storage capacity on your internal drive. If you need more space, buying an external hard drive is a far better option. What this technique is specifically designed for is running multiple operating systems on the same computer system. 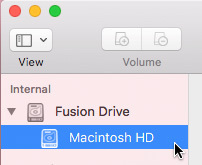 IMPORTANT NOTE 2: If you have a Fusion drive, the SSD portion of the Fusion drive is always associated with the first partition. You can’t move this, nor re-allocate it. So, your new partition will not run as fast as a Fusion drive. Partitioning is not a good idea if your goal is to improve performance. I should also mention that you can only run one OS at a time using this procedure. In the left sidebar, select your internal drive. Most commonly, this is often called Macintosh HD. NOTE: Whether you have an internal SSD, Fusion Drive, or, on older systems, spinning hard disk, I’m going to call this device the “internal drive” because it acts like a traditional hard drive and “drive” is easy to spell. Before you start – and this is IMPORTANT – make sure you have enough free space on your internal drive to create the size partition you want. The bar chart in the middle provides a quick summary, the table at the bottom has the specifics. In my case, my system has about about 1 TB of total storage, with about 542 GB free. Then, from the toolbar at the top, click Partition. NOTE: However, as you’ll discover, High Sierra may not allow you to create a partition this small. I will show you both the error and the workaround. Click the Plus icon under the blue circle to add a new partition. 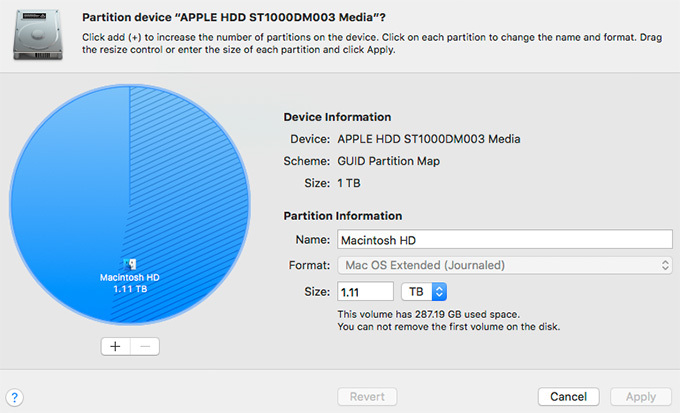 Instantly, your Mac calculates a new partition size; in this case the two sides are relatively equal. The partition on the right is the resized original partition. Grab the white dot and drag it to change the size of the new partition. 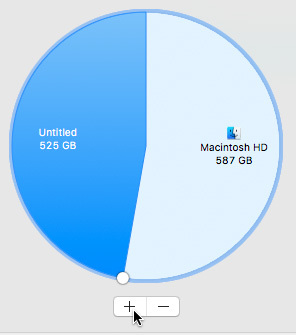 Even though the estimated size of my new partition only needs to be 175 GB, since I have the space, I’ll make it 300 GB. 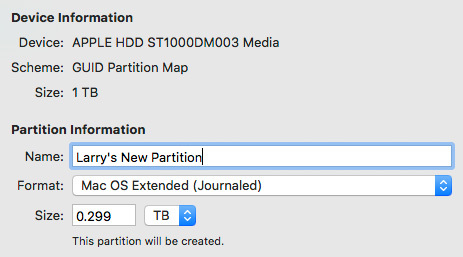 Once you’ve sized the partition, give it a name, this is what will appear in the Finder. Then, determine how you want it formatted. In general, my suggestion is to match the formatting of the existing partition – unless you are formatting it for Windows or Linux, in which case, consult the recommendations for those operating systems to determine the best choice. APFS, as of this writing, will not run on Fusion or spinning hard disks, which means that for my example, I’m formatting this to Mac OS Extended (Journaled). NOTE: For systems which require the maximum in performance, I don’t recommend encrypting your boot drive. My recommendation may change in the future when encryption is handled in hardware. When you are done making changes, click the Apply button in the lower right corner. Up pops a confirming message making sure this is what you want to do. Click Partition. Since any hard disk can be partitioned, a warning message next appears saying that because you are altering the boot drive, everything on your system will slow down while the partitioning process is running. UPDATE: Apple Support tells me that creating a second partition should only take a couple of minutes. In my case, this took much longer. This could be caused by a problem with my hard disk. If you don’t get any error messages and the second drive appears on your desktop, then you are done. If you do get error messages, continue reading. Oops. An error message, our new partition size is too small. Let’s try again, and this time, accept the default size settings. NOTE: The default settings didn’t work either. I needed to make the new partition even bigger. I finally found a new partition size that works. I created a new partition of 600 GB, with the original partition reduced to 512 GB. Again, give the new partition a name, pick a format, then click the Apply button in the lower right corner. Again, it asks me to confirm my settings. NOTE: As you can see from the screen shot above, I forgot to rename this partition. Not to worry, you can change the name in the Finder at any time. BIG NOTE: Apple tells me this is NOT typical. It is probably caused by a problem with my system. Creating a partition should only take a few minutes. When you are done, you’ll see a new empty hard disk on your desktop. Like any other drive, you can change the name at any time. This is the new partition. You can use it just like any other hard disk – with the added advantage that we can install a different operating system to it, then boot from it. Yet, as you can see from the left side-bar in Disk Utility, both Macintosh HD and Untitled are two sections of the same Fusion Drive. IMPORTANT NOTE: You must install an operating system onto the new partition in order to boot from it. Creating a partition creates an empty space, you still need to install an OS and applications on it to make it useful. After installing an operating system, you can boot into the new partition by restarting your Mac. Then, when you hear the chime, press the OPTION key. This displays all the available hard disks. Use the left/right arrow keys to navigate to the hard disk you want to boot from and press Enter. 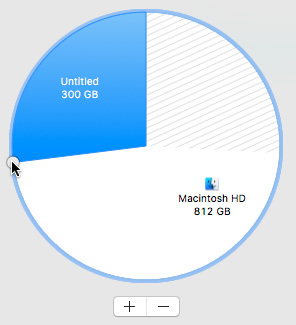 Reopen Disk Utility, select the partition you want to remove (it turns blue) and click the Minus icon under the blue circle. 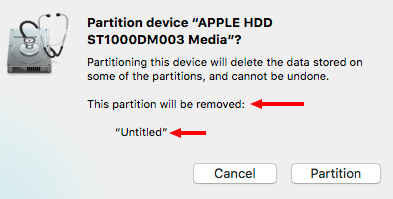 Then click Partition to confirm this is the partition you want to remove (you can’t remove the original partition). Removing a partition takes about an hour and a half to reconfigure the boot files. Again, not fast. BIG, BIG NOTE: Removing a partition permanently deletes all data on the partition. You can’t get it back. Only remove partitions when you have safely copied any and all data that you want to keep to a different location. I don’t create partitions every day, but I do use them several times a year. It is a very useful technique to know – especially when you want to keep older versions of the macOS running on your system, run different versions of the same app, or install non-Mac operating systems. 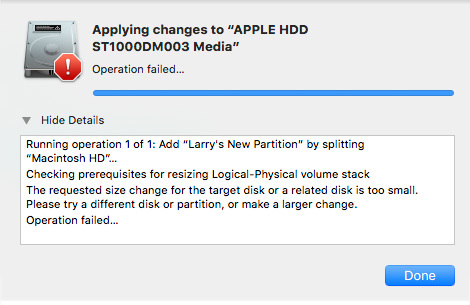 Thanks Larry, This is very timely for me as I am upgrading to High Sierra and just about to install a new 2 Tb SSD into my MacPro Trash can, and I want to retain access to some of my 32bit applications. Am I correct to think that I should format (one or both) partitions as APFS or APFS case sensitive? Case-Sensitive means that if you have two files with the same spelling, but different capitalization, they are treated as two separate files. User names are not case sensitive, while passwords always are; regardless of formatting. In general, I personally don’t use Case Sensitivity, but the choice is yours. Does it work in the other direction? 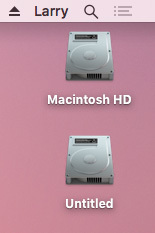 I have a Mac Tower held at 10.8 to support legacy apps. It has a second dual boot partition created at the time for a Windows install? Can I install High Sierra on that second partition? As long as High Sierra will run on your hardware, yes, this works both ways. My partner had a little extra time this holiday week and decided to take it upon himself to upgrade our editing system to Mojave. Unfortunately he did not check for compatibility with our software, namely FCP 7 and DVD Studio pro. Is there a way to use a partition to revert to the old OS to be able to recover access to those programs? He did, thankfully, back up the computer with Time Machine prior to upgrading to Mojave. 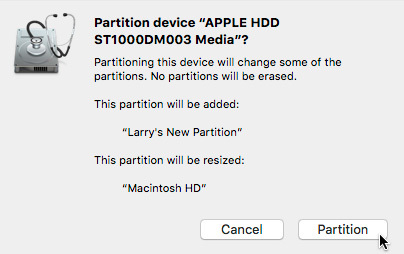 Yes, a partition will allow you to run two different operating systems. That’s the good news. The bad news is that, unless you have the original DVDs the OS was insulted from, you won’t be able to download older versions of the macOS. That will require a trip to the Genius bar at an Apple store. Worse, creating the partition and installing an older operating system is only half the solution. Now, you’ll need to find the original DVDs for FCP 7 and DVD Studio Pro and reinstall them. My suggestion, before you do anything more, is to talk with an expert at either Apple Support or an Apple Store. Figure out what’s possible and the best way to revert. Just as a reminder for others, it would have been easier to create a new partition and install Mojave on it, rather than update your current partition. Thanks for the reply. One other question: If the entire system was backed using Time Machine prior to the Mojave upgrade, can I restore the Mac to the pre-Mojave state using the Time Machine backup? As I understand your question, yes, you should be able to do that. Will this process work on modern Macs (2015+) as I believe there are new restrictions implemented by Apple to restrict booting into an earlier OS than the Mac shipped with ? You can’t install a version of macOS that is older than your computer, but you CAN install versions that are newer.